Submarines generally attacked while submerged during the day, or in the Pacific on the surface at night. The Germans used night surface attacks extensively early in the war, but less so as radar equipped escorts began to make the practice too dangerous. The Japanese never developed really effective shipboard radar. Submarines are significantly more vulnerable to damage than surface ships. Most of the time, if there is any armor at all on a submarine, it is installed around the bridge, and intended to protect only against light caliber weapons and shell splinters. Surface warships are usually more heavily armored. A submarine’s primary protection comes from its ability to submerge. A submarine’s primary weapon is the torpedo. In World War II, the most common type was the 21-inch (533 mm) torpedo, powered by either a small steam turbine, or by electric motors and batteries. The electric torpedoes were often referred to as “wakeless,” as they did not leave a visible trail of exhaust bubbles behind them. The Japanese Imperial Navy fielded a 24 inch (610 mm) oxygen torpedo in destroyers, and a 21 inch version of the same torpedo in submarines. This “long lance” torpedo, which carried a 1000 pound warhead, has generally been acknowledged as the most effective torpedo ever built from the standpoint of ship killing capability. Oxygen torpedoes, which use pure compressed oxygen instead of compressed air to support combustion in the power plant, are also nearly wakeless. This is because the pure oxygen is fully consumed in the combustion chamber. Compressed air, composed of 90% incombustible nitrogen, sends the nitrogen out the tailpipe, creating the bubble wake. Also, because pure oxygen takes up much less room than compressed air for the same burning time, the tank need be only about 20% the size, which leaves more room for the warhead. In order for a submerges submarine to sink anything, it needed a way to aim the torpedoes. Different navies evolved different methods. During the inter-war period, American doctrine favored the use of Sonar for determining target range, bearing, and angle. It was believed that advances in anti-submarine weapons—particularly aircraft, but also Sonar and radar—had made it suicidal to expose a periscope in daytime. In inter-war exercises, if a lookout on a destroyer sighted a periscope, it was essentially scored as a kill. Once the war started it quickly became obvious that sighting a periscope didn’t mean you’d always find the sub once you started hunting for it, but as long as that presumption continued the Navy took a lot of trouble to develop and install highly sophisticated hydrophone and active sonar suites in their submarines. They also installed Torpedo Data Computers that were far more advanced than anything any other country would field until well after the end of the war. Eventually, the torpedo problems turned out be the result of penny pinching between the wars. Torpedoes cost roughly $10,000 to build in a time when you could buy a new car for less than $1,000. As a result, almost no live tests that involved actually shooting a torpedo with a live warhead at a target were conducted. The ubiquitous Mark 14 torpedo, it turned out, ran about 11 feet deeper than it was set. Even worse, the Mark 6 exploders, with their super-secret magnetic triggers, didn’t work. The magnetic exploder would either set the warhead off prematurely, or not set it off at all. And even when the magnetic exploders were removed, and the depth problem fixed, it turned out the regular contact exploders didn’t work very well, either. All of these issues were diagnosed in the field while BuOrd continued to blame the captains. While the bureaucrats continued to overlook the torpedo problems, the submerged sonar attack was quickly eliminated once the war began. The skippers recognized two facts. First, they weren’t hitting anything using Sonar alone. Second, as long as they were careful, it turned out to be a lot harder to see the slender head of an attack periscope than the theorists believed. Somehow, it never seemed to occur to the theorists that lookouts in an exercise had an advantage over lookouts in combat, because in the exercise the knew for sure that there was a submarine somewhere around, while in combat all they knew was that one might be encountered at some point in a voyage of several hundred miles. The upper section of an attack periscope was made as slender as possible to reduce observability. The limiting factors were the size of the upper lens, which had to be large enough to insure adequate daylight viewing, and the upper prism and alignment mechanism. The upper prism could be tilted from the conning tower, to allow the field of view to be elevated for air search, or lowered to look close in. 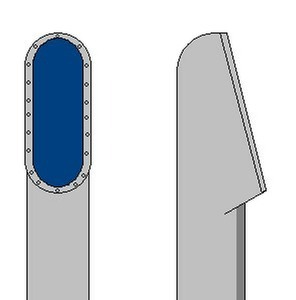 If a periscope designer, and the Navy that employed him, was willing to forego the air search capability and build a periscope with a fixed head, the diameter could be extremely small. In some cases not much more than half an inch. The standard attack periscope used in American fleet submarines was 1-¼ inches in diameter at the upper end. Search, or “night” periscopes had a larger head for increased light gather ability. Late war American search periscope had a radar wave guide incorporated into the head, which was used for precise range finding. The outer part of the of the left handle rotates, elevating or depressing the upper prism. The button on the inner part of the handle is a detent, and the handle clicks into preset positions as the field of view is raised or lowered. By doing a full sweep of the horizon with the handle clicked into the high, centered, and low positions the observer can get full coverage in three sweeps. The right handle also has a rotating outer section, and this handle is used to adjust magnification. Optically, the periscope is a telescope, and magnification ranges from low 1.5 power to high 6 power. The crank below the right handle is the stadimeter control. A stadimeter is a rangefinding device, and ranges are read from the large black dial at the bottom of the periscope. This dial is duplicated on the opposite side of the periscope, where it may be read by the approach officer. Also at the rear of the periscope, in the lifting collar, is the bearing ring. When the periscope is pointed directly at the submarine’s bow the bearing is zero, and target bearings are given relative to the submarine. Target bearing should not be confused, as it frequently is in movies, with angle on the bow. Target bearing is the relative bearing from the submarine to the target. Angle on the bow in the angle at which the target is crossing, approaching, or moving away from the submarine, as measured from the target. (The British call it reverse angle.) 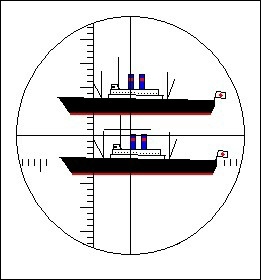 If the target is heading directly at the submarine, angle on the bow is zero. If heading directly away, angle on the bow is one-eight-zero (angles are always reported by speaking each digit). A target directly ahead of the sub and crossing from right to left has an angle on the bow of port niner-zero. This image shows the view through the periscope with the stadimeter in use. A split prism creates a double image of the target, in this case a Japanese troop transport. Using the controls, the observer has placed the waterline of the upper ghost image on the masthead of the lower true image. Once this has been done, the masthead height is set on the stadimeter dial, and the distance in yards read. The stadimeter actually measures angles, not distance, so the distance will only be accurate if the masthead height is correctly estimated. Surveyors use the same system for determining distances, but have the advantage of targeting a graduated pole of known height. In practice, the most accurate readings were always made during exercises, when the targets were friendly vessels with known masthead heights. There was some obvious guessing involved with enemy vessels, though recognition manuals listed masthead heights based on available intelligence information. This tended to be more accurate for older vessels, where masthead heights had been measured before the war. Once a submarine finds a target, the approach and attack is essentially an exercise in applied geometry. 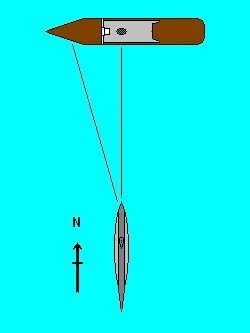 The captain needs to determine the precise angle at which to fire his torpedo for it to intercept the target and destroy it. In stationary objects, this is easy. When you’re firing a rifle, you simply point it directly at the target and pull the trigger, and if both the rifleman and the target stay still you get a hit. It’s the same with firing a torpedo at an unmoving vessel. As long as the torpedo runs straight it will hit. The problem with this, obviously, is that neither the submarine nor the target are likely to remain still. With the rare exception of attacks on anchored or moored vessels—Prien’s attack on HMS Royal Oak at her Scapa Flow mooring being a prime example—submarines normally encounter their targets at sea, where both will almost always be moving. In this situation, you can’t shoot at where the target is. You have to shoot at where it will be when the torpedo reaches it. In this graphic, the approach has begun. The submarine is moving due north at 2 knots. The target is moving due west at 6 knots, and is currently located to the east of the submarine’s track at a distance of 4 nautical miles (in order to fit everything in, this is obviously not to scale). Also, the submarine is shown surfaced for clarity. It would more likely be submerged for a daylight attack. The approach officer reads the bearing off the bearing ring. This gives the relative angle from the submarine to the target. In this case, the bearing is 45°. For clarity, this is reported as zero-four-five. During a submerged periscope attack, target bearings are always given as three numbers to avoid confusion. Surface lookouts, however, would report the same bearing as “starboard four-five,” referring to the side of the ship the target is located on. In some navies “red” and “green” are used instead of “port” and “starboard,” these being the colors of the navigation lights on those sides of a ship. Once the target bearing has been determined, it is entered into the Torpedo Data Computer (TDC). This is an extremely sophisticated electro-mechanical analog computer. Two basic types were used during World War II. In most navies, the TDC was an angle solver only. It would give the correct torpedo gyro angle for whatever data was currently entered. The American version added a position keeper, which was capable of keeping track of the target’s position in real time, presuming accurate data was entered initially. This was a significant advance, and made targeting much easier. The TDC will always know the submarines own course and speed, as these are constantly updated from the gyro compass and log. (This log is the submarine’s speedometer, by the way, not the book the captain uses to keep track of the day’s events.) The TDC now also has the target bearing, but still doesn’t have enough information to work out a firing solution. Now the captain needs to know how far away the target is. To do this, he first needs to know just what the target is. Looking through the periscope he can see that it is a medium sized two stack liner, flying the Japanese merchant ensign. In these waters that means a troop transport, as there is no civilian transport to or between the islands in this area. Looking through his recognition book he finds that what he sees matches the Oyama Maru, an 8,480 ton liner, and a legitimate target. Now that he knows, or at least thinks he knows, the identity of the target, he looks up the masthead height. This is the distance from the waterline to to highest point on the ship. According to the recognition manual, the distance is 100 feet. The figure is entered into the stadimeter dial of the periscope. Range may also be determined by using the active Sonar. A single ping will give an accurate range, and without having to know the target’s masthead height. But there are two destroyers escorting the transport, and it’s likely that if he pinged the target one or both of them would hear it. Late war search periscopes also incorporated range finding radar, but in a daylight attack it seems safer to use the thinner, and less noticeable, attack periscope. Working the stadimeter dial, he places the ghost image’s waterline on the masthead of the true image. The principle is really very simple. The stadimeter determines two angles of a triangle formed by the periscope lens, the waterline of the target, and the masthead of the target. If the angle is 1°, some fairly simple math tells you that the only distance at which the vertical compenent of a 1° triangle is exactly 100 feet is one nautical mile. The function of the stadimeter is to measure the angle and do the math for you. A potential problem with this is that accuracy is completely dependent upon knowing the true masthead height. In our example (but not in the graphic, which is exaggerated) the angle turns out to be 1/4° above the horizontal. Using the formula R=h/tan(θ) this places the target four nautical miles away. The stadimeter does this automatically, without the captain or approach officer having to remember their high school geometry, and indicates that the target is 8,100 yards away. This range figure is read off the stadimeter dial and entered into the TDC. In order to work out a shooting solution, the captain also needs to know the target’s angle on the bow. This is not the same thing as the target bearing, despite what you might think from watching a lot of movies. 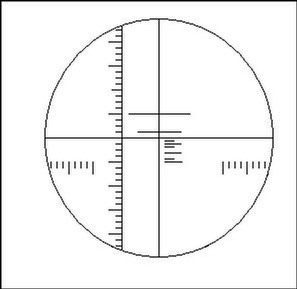 The target bearing tells you where the target is in relationship to the submarine. Angle on the bow tells you which way the target is going relative to your own course. The final factor is the target’s speed. There are several methods of obtaining this, though none can be called 100% accurate. First, periscope observation. 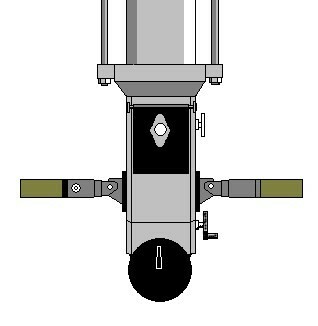 The periscope optics are marked in degrees in both the vertical and horizontal axes. If the distance to the target is known, it is relatively easy to determine speed by timing how long it takes for it to travel a fixed number of degrees. (This is the method a Highway Patrol pilot uses to catch speeders, though he’s measuring time between two marked points on the highway.) The most obvious problem with this method is that it means leaving the periscope up while you’re timing the target, and Japanese ships were armed and might start shooting at you if the spotted it. Second, general knowledge. Some types of vessel were known to generally travel at a particular speed. This would usually be the most economical cruising speed. However, since the target’s captain may be in a hurry, or may be moving slower than usual, this is generally the least accurate method. An experienced submarine captain can sometimes make a fairly good estimate of target speed by observing the bow wave. This, of course, is why ship camouflage schemes often include painted-on false bow waves, to give the illusion of greater, or lesser, speed. Third, counting revolutions. The Sonar operator can listen to the sound of the target’s propellers and determine the number of revolutions per minute. If the submarine captain knows the pitch (the distance traveled in one revolution with that particular propeller), he can make a fairly accurate estimate of speed. For instance, a screw with a 24 foot pitch should move the ship forward 24 feet for every revolution. One hundred revolutions should, therefore, move the ship forward 2,400 feet, or 800 yards. This would give a rough distance traveled of one nautical mile (2,025 yards) every 2-½ minutes, or a speed of about 23.7 knots. This sort of speed would generally indicate a large warship or passenger liner. Freighters are generally slower, topping out at around 16 knots. Fuel economy was the major factor in those speeds. Going fast uses a lot of fuel, so high speeds were for moving passengers, where the line could charge higher prices for quicker crossings, or specialized freighters like banana boats, which had to deliver their cargo before it spoiled. (Contrary to the stereotype, banana boats actually tended to be both modern and very fast.) Warships also tended to be fast, and in that case fuel economy was considered a minor factor, as the taxpayers were picking up the bill. In any case, if screw pitch is known, a fairly accurate estimate of speed can be made by counting revolutions. The major issues here are actually knowing the correct pitch, and the fact that a ship’s screws are far from 100% efficient. Only submarines really come close, and only at considerable depth, where water pressure suppresses cavitation. Once the target’s speed has been determined, this is also entered into the TDC. At this point everyone waits a few minutes and takes another observation. If all the data was correct, the target should be precisely where the TDC’s position keeper says it should. If it isn’t, more observations are taken and the corrections dialed in. Several observations over a period of ten to fifteen minutes should eliminate the error—or at least reduce it to the point where a hit is more likely than a miss. As the TDC works out these solutions, the gyro angles it calculates are automatically transmitted to the torpedo rooms, where they are programmed into the torpedoes. Gyroscopic guidance allows the torpedo to be programmed to follow a set course once it leaves the tube, so it is possible to aim the torpedo without having to aim the boat, as was the case with the older, straight-running torpedoes. While all of this is going on, the running depth for the torpedoes is also set. This particular target has a load draft of 38 feet, so the torpedo is set to run at 25 feet, insuring that it explodes well below the waterline. If a magnetic exploder is being used, which, this being late in the war, it wouldn’t be, as even BuOrd had conceded they didn’t work by then, the depth would be set to 43 feet, five feet deeper than the keel, so that it would explode directly under the keel. The graphic shows the submarine and target at the time a firing solution has been worked out. The target is now directly ahead of the submarine, at a distance of 1,400 yards. With the Mark 14 torpedo set to run on high speed (46 knots) it will take one minute to cover that distance. In that minute the ship will have steamed another tenth of a nautical mile, or about 200 yards. In other words, if the torpedo is fired straight at where the target is now, by the time it gets there the target will be gone and the torpedo will pass harmlessly behind it. The TDC calculations takes this into account and sets the torpedo gyro angle to a course of 350° relative to the submarine’s course.This means that the torpedo travels at a 10° angle to the left, so that its relative bearing to the target remains unchanged. Any two objects that maintain a constant bearing in a crossing situation will eventually collide (something to keep in mind when you’re merging onto a highway). 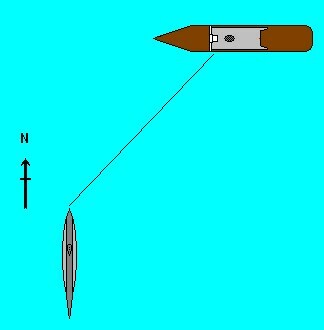 By having the torpedo “lead” the target it should hit close to the center of the target and have a good chance of sinking it. Once the torpedoes have been fired, the submarine may stick around to confirm the sinking. Or, if there are escorts around, the captain may decide it’s more prudent to clear the area before they can find him. If it’s possible to stay around, a camera could be attached to the eyepiece of the periscope and pictures taken. More than one captain found these photos very useful later in the war, when JANAC tried to claim nothing had been sunk in that area at that time because the Japanese records had been lost.